This is such a fun image. I was documenting a political delegation’s trip to Springfield, IL. 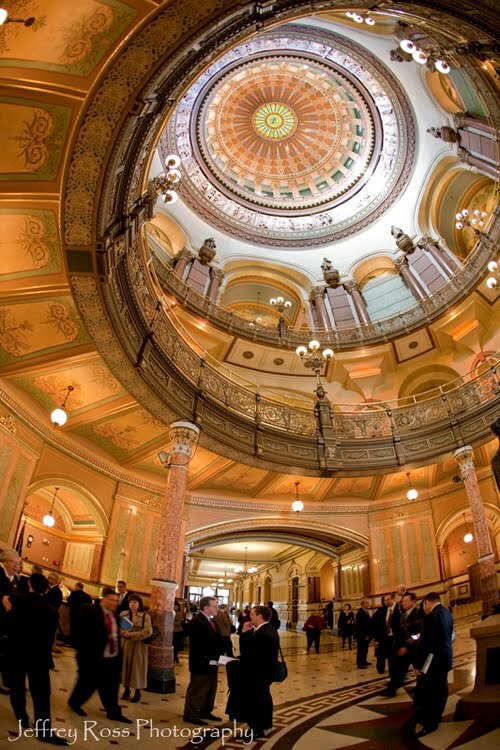 During a short break in the schedule I decided to photograph the beautiful dome in the State Capitol. This was taken with my wide-angle 15mm lens, which has a fisheye effect. In the same image you see straight ahead out of the hall, and straight up into the dome. As with all the images here, you can click to enlarge it. Juliette Miranda’s book “Morning Neurosis” is out and available now. I’ve known Juliette for years, and I’ve been fortunate to hear some of her rock n’ roll tales (usually while we were sampling a few margaritas.) But it’s great to see it all in book form. I took some of the photos that she uses in her press and on the book jacket. Enjoy it with or without a margarita. I am working on new promo pieces that I will sending out in the next few weeks. During my customary harddrive search for interesting images that will dazzle and amaze I found a few that I took for sculptor/artist Patrick Dougherty. A few years ago he created this temporary structure he called Xanadu at the Morton Arboretum in Lisle, IL. The scale might be deceptive in the image, but it was as big as a two story house and made entirely of sticks and twigs. There aren’t too many times in my life that I can honestly say, “I’ve never seen anything like that before”, but honestly… I haven’t! It was a whimsical creation right out of a fairy tale. Unfortunately images just don’t do it justice. This is one of those thing you had to see to believe. Mr Dougherty wanted some photos of Xanadu in the snow, so that’s what brought me out here on this cold winter day. The second photo should give you a better idea of the size of it. I took some photographs recently of businesswoman Mae Calamos for Naperville Magazine. The above photo runs in the print version of the most recent edition. The image below appears in the online version. You can read the story at Naperville Magazine’s website here. The location is the beautiful CityGate Grille restaurant in the Calamos building.